A relatively recent recent release by Studio Ghibli brings us another world of adventure, fantasy, love and hate. Howl's Moving Castle is one amazingly compiled and wondrous anime to enjoy watching. What makes Studio Ghibli films so enjoyable to watch? Well for one thing, the endless imagination is mixed into the presentation of the film. 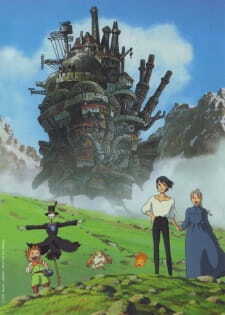 As such, Howl's Moving Castle provides us with endless possibilities of a well-structured story. This brings us to Sophie, a average girl which suddenly ends up with Howl. Hence, a huge story unfolds with a world war, love and hate, jealousy and revenge. It is all mixed in quite well and the story never ceases to amaze me at how emotional this film can be. Studio Ghibli has done it again. The art is always perfect for the films by Studio Ghibli. They have put much effort into bringing a wonderful experience to the screen. The artwork is just stunningly beautiful. The detail on the castle is great, the war scenes looked realistic and the detail in the characters were refined. I can say just be looking at the art will captivate you in an instant. A solid performance in background and theme music. I loved it all. The voice acting was a solid effort and I have no complaints here. The sound effects were amazing, from the blazing gunfure from the war to the breeze on the grass, every minor detail has been implemented really well. Let me talk about the characters. Howl for one thing, is mysterious. You do not get to fully understand him to the very end. Thus, it is all pretty mysterious surrounding who he is and what is he up to. Sophie on the other hand can be considered as naive as she discovers a whole different perspective of the world around her. As said, the main characters have unique personalities and in the end love prevails all. There are many quirky characters also to be found throughout the anime that will keep you entertained. Overall, I enjoyed this film very much. Since its release I probably have watched it a few times now. It never ceases to bore me and every time I always felt emotional in the end. Its that kind of story that will keep on dragging you in no matter how many times you watch it. Of course, this is a film dedicated to Studio Ghibli fans that love the art style, story and action that is with most of their other works. So if you are a action, adventure, fantasy fan then this film is for you. Well told and brings a lot of feeling throughout the anime. Just stunning. Highly detailed in every way possible. Solid background music to support the film and brings out a lot of emotion. Quirky and mysterious characters is what this film is based on. Really enjoyed watching it. One of my earlier encounters with anime films. What can I say? This just sums it all up into one word - thrilling.